The modular BETT™ systems can be integrated with full-solutions for onsite treatment. Aquacycl™ provides competitive leasing and service packages so customers can avoid capital expense and realize immediate cash savings for onsite wastewater treatment. 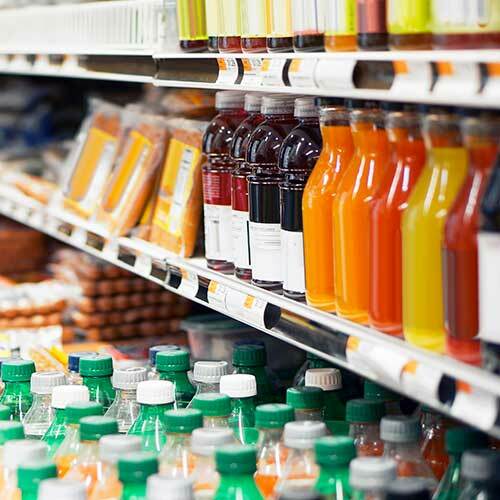 Custom systems are available within weeks or months due to a highly scalable platform technology. 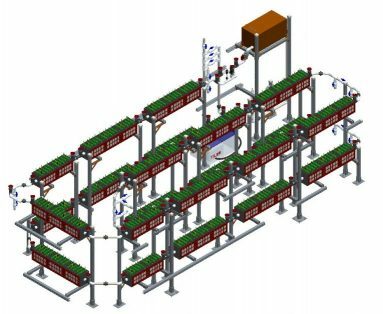 BETT™ Packaged Plant flow capacity, footprint and effluent quality are dependent on wastewater composition and loading. Some specifications are provided here as a baseline. Please inquire regarding your application. 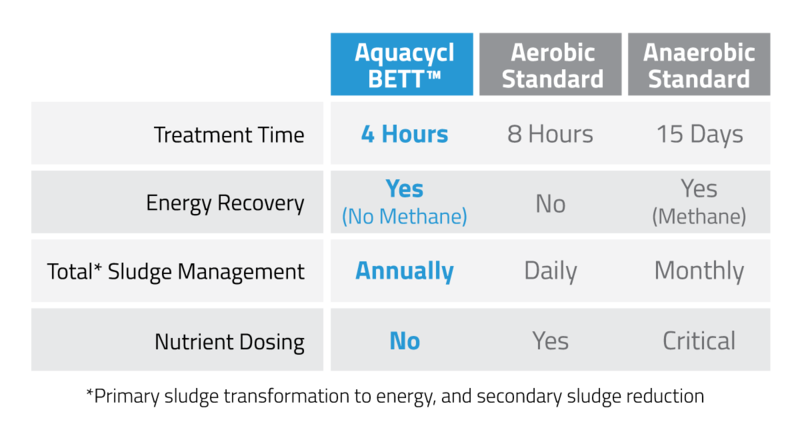 Aquacycl™ has developed the BioElectrochemical Treatment Technology (BETT™). 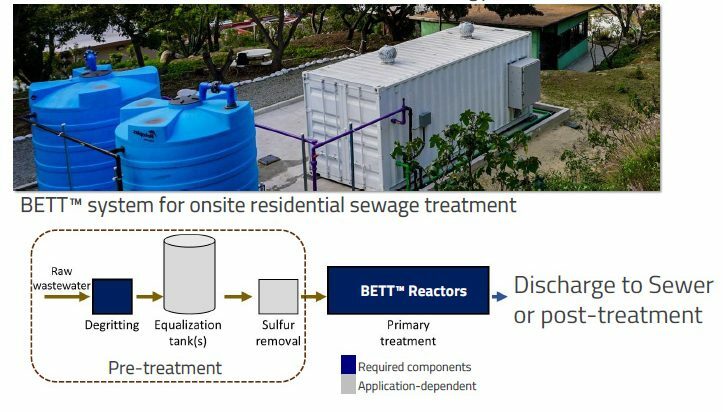 The BETT™ systems select and control natural bacteria for the purpose of accelerating wastewater treatment rates, eliminating primary sludge, minimizing secondary sludge, producing electricity and making new molecular water. Electricity generating, anaerobic biofilms (brown), form on the anode electrode and begin degrading the sludge and organic carbon contained in wastewater. The electricity-producing microbes transform nearly all incoming waste into electrons, protons and carbon dioxide (dissolved in solution as bicarbonate). The electrons from the process are transferred to the anode electrode through a process called microbial extracellular respiration, whereby the microbes use the anode surface to “breathe”. The anode and cathode are electrically connected with an external load (resistor), which allows the electrons to flow across the circuit at a fixed rate and produce direct electricity (yellow circles). 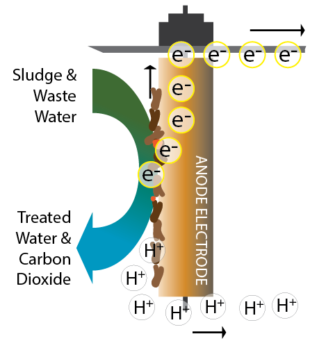 Electrons are then accumulated at the cathode (right, dark grey) where they react with oxygen that naturally diffuses through the proprietary cathode electrode, and protons conducted through the wastewater, to produce hydrogen peroxide and/or new water. The Aquacycl systems do not require any forced air. The reduction of oxygen to hydrogen peroxide and water is catalyzed by Aquacycl’s proprietary catalysts. 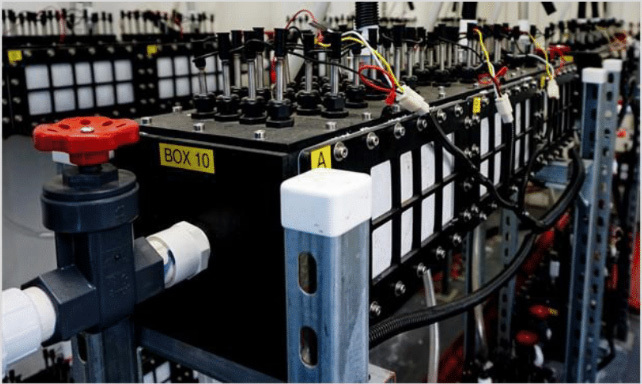 Microbes will also grow on the surface of the cathode that is in contact with the solution; however, these cathode microbes do not produce electricity and instead will use unreacted oxygen to grow an aerobic biofilm and remove oxygen from the bulk wastewater solution. 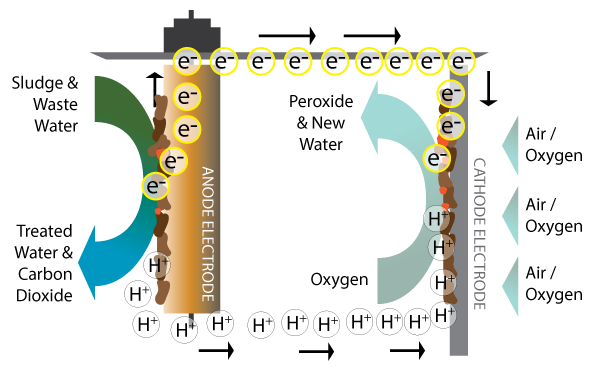 The inherent hydrogen peroxide production helps to minimize the biofilm growth at the cathode to avoid maintenance or regular replacement. No component failures or performance decreases have yet been observed in outdoor applications, running since March 2016. 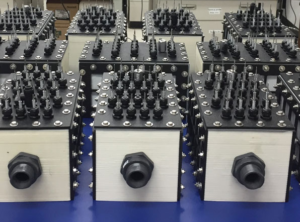 The proprietary electrodes are integrated into patent-pending reactors as shown here. 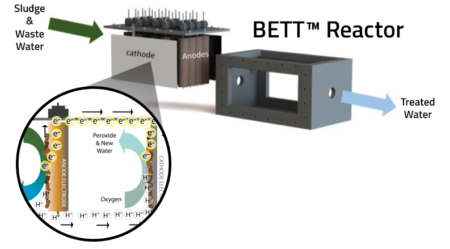 The bioelectrochemical reactions described above take place within each BETT™ reactor, which is roughly the size of a car battery. 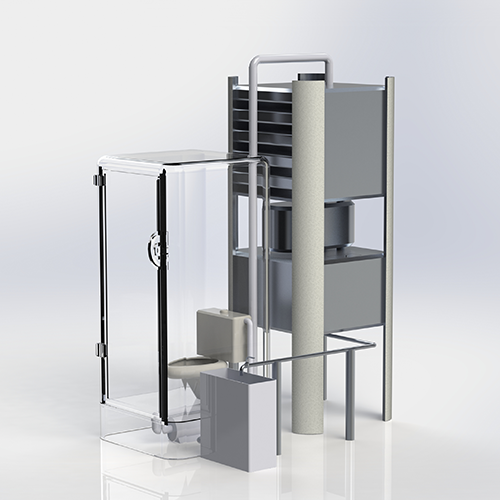 The BETT™ reactor design is very modular so that units can be stacked like Legos™ within a given footprint to provide wastewater treatment for industry, agriculture, military, or commercial/residential applications (see below). The BETT™ reactors are modular units that are arrayed together to provide wastewater treatment at different scales (< 100 gpd to 150,000 gpd). 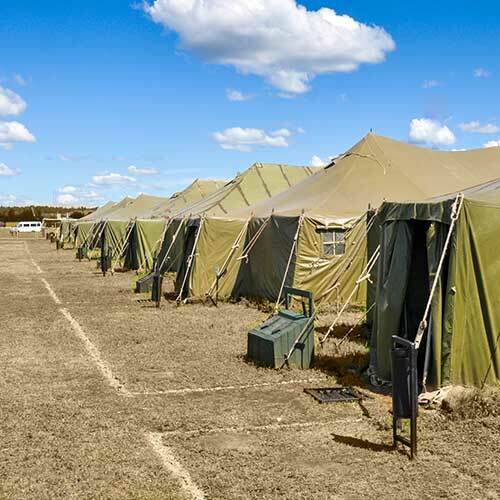 BETT™ systems are designed to work with or without existing energy or sewer infrastructure. Fully integrated units can be customized to include pre- and post-treatment equipment that will guarantee water quality for discharge and/or reuse according to end-user needs (shown below). All BETT™ installations include grit removal and maceration as pretreatment steps to remove objects like sand and rocks and ensure a small particulate size for all suspended solids that are fed to the BETT™ reactors. Installations designed to treat residential sewage or high-protein waste streams also include inexpensive equalization tanks and very low-cost sulfur removal processes as a part of pretreatment. Wastewater treatment happens in a series of BETT™ reactors operating continuously to eliminate a majority of primary sludge (up to 80%), dissolved carbon, nitrate, nitrite, and residual sulfur compounds. BETT™ reactors can be arrayed together inside a standard-sized shipping container (as shown below). The flow diagram shows how BETT™ installations may be integrated alone or as part of a full-solution to deliver specified water quality. 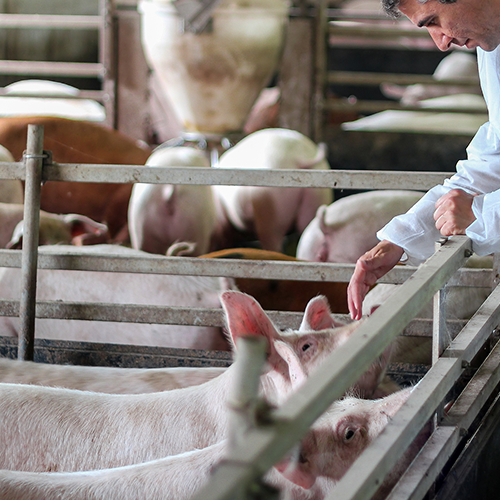 Post-treatment processes like tertiary treatment and disinfection technologies will be uniquely selected for each application based on customer needs, wastewater source, scale of installation, and water quality requirements.